I've been following The Folio releases since the first issue and have been pleased with the consistent quality of the releases. I expect the same high quality with The Folio #22. 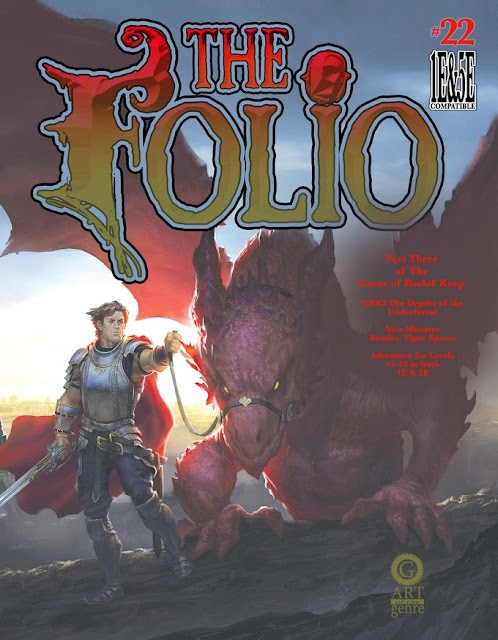 What is included in Folio #22? This module will provide the adventurers with access to Level 3 of the Kasbah Dungeon as well as a new monster that even threatens the existence of the Infernal Machine. 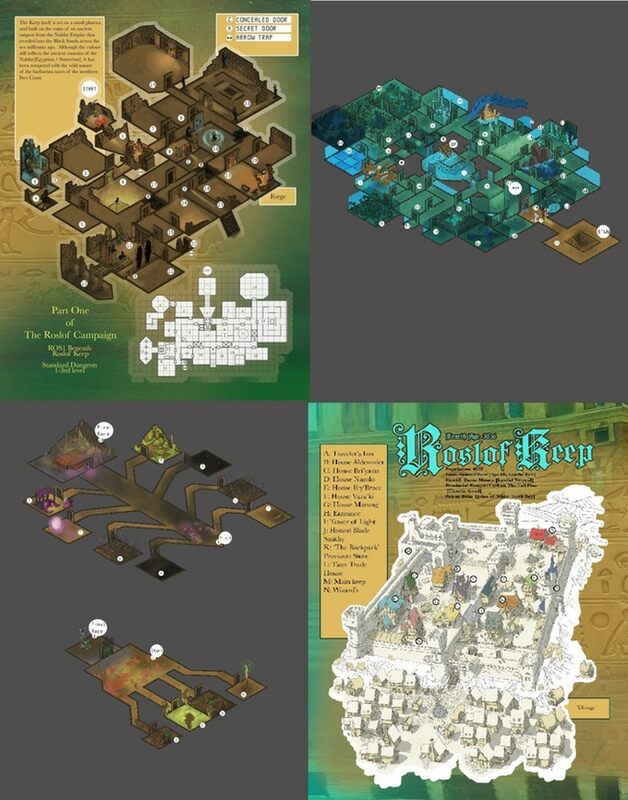 Dungeon details include 2D standard 'blue' hex maps as well as fully 3D renderings of Level 3. 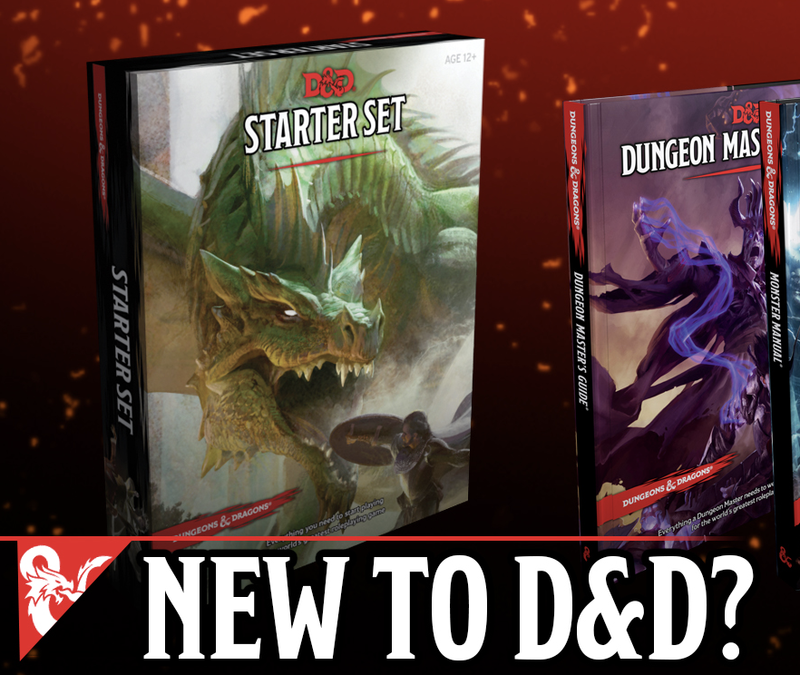 It also features a fully removable stand-alone cover that can act as a DM screen. The Folio has released consistently on time and I see no reason why that trend should end. 10 bucks for the PDF, 18 for the Print plus PDF. This weekend I plan to kick off a series of Tenkar's Terrible Theurgy posts. New spells, magic items, weapons, armor, constructs, creatures, classes - if it is magical in nature, it fits the bill. 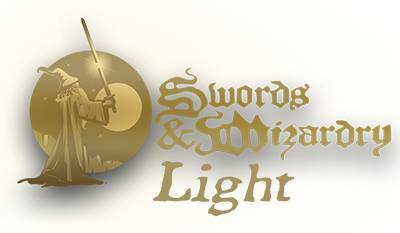 The posts will be written for use in Swords & Wizardry Complete, so compatibility with other OSR rulesets should be spot on. They will be released under the OGL. Level 4: Dagger of Fire: Once per Day can summon a Magical Flaming Dagger. Only the Elementalist can wield it. It lasts for 1 round per level (throwing the dagger dispels it early). The Dagger is +1 to hit per level of the Elementalist and does 1d6+3 damage. 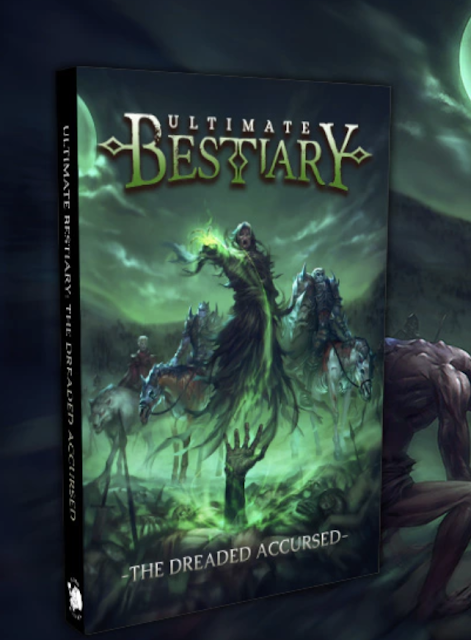 Kickstarter - Ultimate Bestiary: The Dreaded Accursed for 5th Edition! 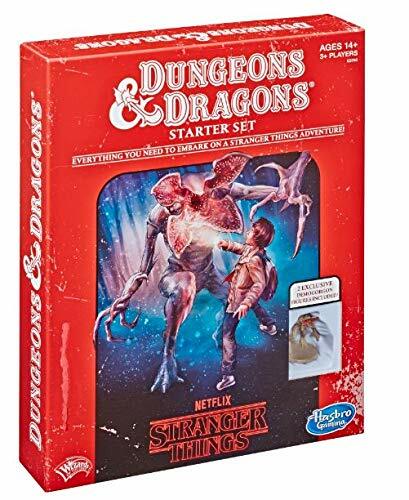 "Over 130 new horrific monsters to add to your 5th Edition game! More details, more options, more variations, more fun!" Ultimate Bestiary: The Dreaded Accursed for 5th Edition! looks to be my cup of tea, even if it is for 5e ;) Seriously, great art and concept from a publisher that has delivered solid 5e releases in the past. Ultimate Bestiary: The Dreaded Accursed is not another A-Z of monsters. Instead, following on from its predecessor Ultimate Bestiary: Revenge of the Horde, we have focused on some of the commonly encountered undead and accursed monsters like ghosts, ghouls, liches, lycanthropes, and vampires, detailing their origins, environments, and attitudes, as well as introducing a wide variety of stat blocks to suit a range of challenge levels, with a huge variety of unique artwork. Please make sure tankards are washed PROMPTLY and THOROUGHLY. Arteus is clearly upset by mess and clutter and I don’t want to spend another day cleaning up the common-room and scrubbing blood out of the walls. YES, it is hypocritical that he wrecks the place when he’s upset. NO, there is no value in trying to point that out to him. So, James Spahn approached me and said something to the effect of: "You know what we are missing as a community? A place to organize and find "One Shot" RPG sessions." 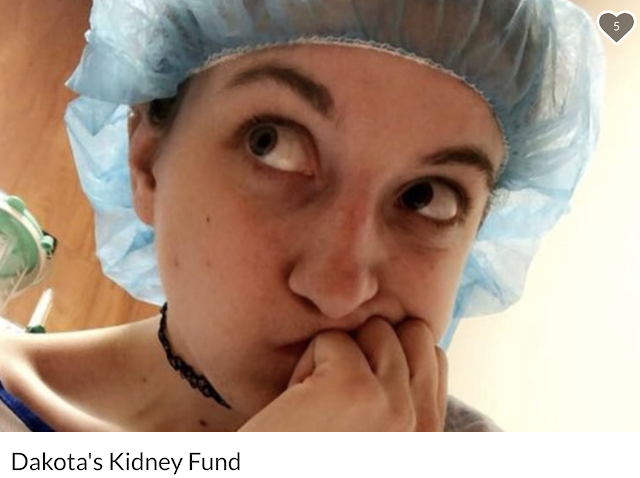 And James was right. One-shots are great when you simply want to grab a group of players and game. Or if you are looking for players to playtest an adventure. Or you want run G1 and your home group is nowhere near the levels needed. Or simply just because. Jame suggested a Facebook Group. I told him he should do it, and he has. Right now we are simply growing the group's numbers. In a couple of weeks, I'll be recruiting for a one shot RPG session from the group. I expect others will too. 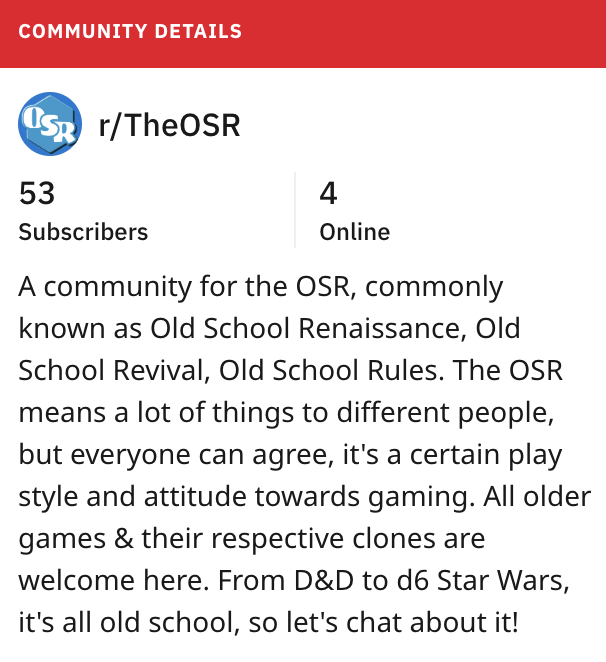 Reddit - TheOSR - New Reddit Page / Community / Thread? I'm not a huge user of Reddit. That being said, with the death of G-Plus, the refugees of the various OSR communities have been exploring Reddit as a replacement option. 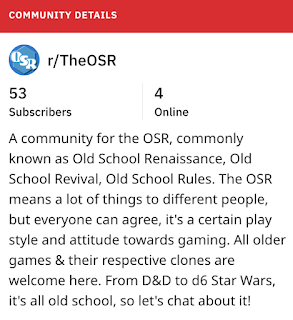 https://www.reddit.com/r/TheOSR/ is a recent addition to the OSR scene on Reddit. 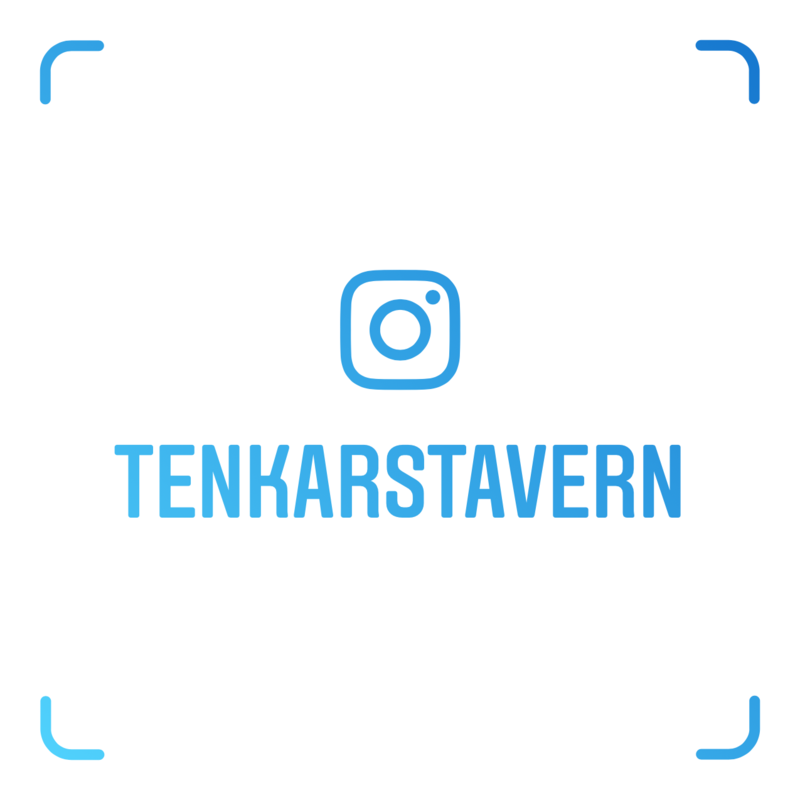 Surprisingly, it is very heavy on sharing various posts from The Tavern (not shared by me). It needs more sharing from the OSR at large to be viable, so if you have links to share or conversations you might want to have, give it a peek. I do love zines. 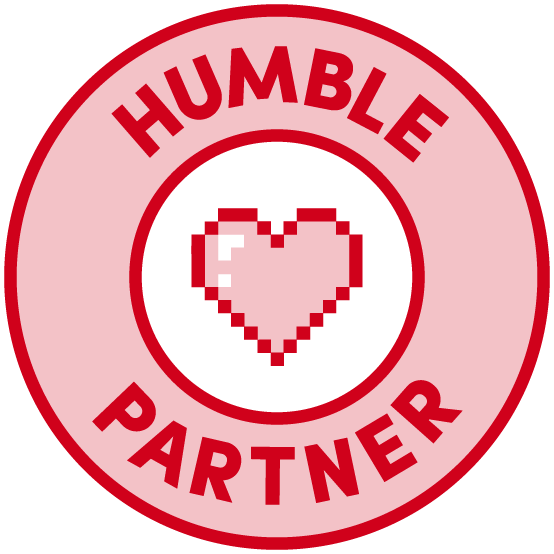 They bring me back to my college days, when one could go to game stores like The Complete Strategist and find a score or more different RPG magazine, professional and self-published, on the magazine rack. Of course, I never had enough cash to buy . all the ones that I wanted, but they gave an amazing bang for the buck in any case. Maximum HP is a zine I would have purchased back in the day and I am backing it today. In our inaugural issue, we explore the dwarven community of Dwarfhome mountain in Artera. We chose to focus on dwarves this issue because there are so many possible directions to go with them rather than presenting them as just dour short people with Scottish accents. 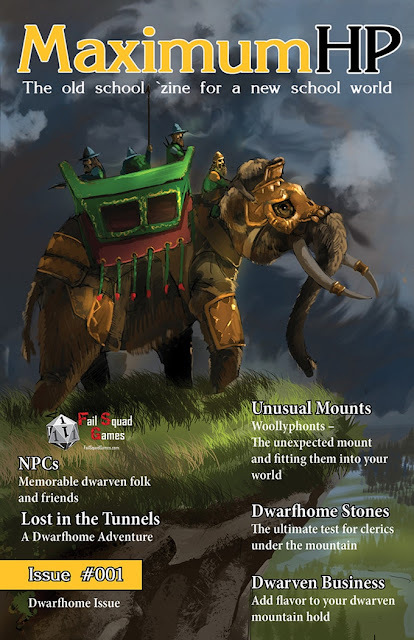 Though we focus on Dwarfhome, the information and quest provided can be inserted into any dwarven society to bring life to your old school campaigns. From here we catalyze your creativity with our world of imagination, ideas, and quests. So, grab your dice good adventurer, grab your books good GMs, and get ready for Maximum HP!! Welcome to Artera, welcome to Fail Squad Games! Each issue is 5.5″ x 8.5″ (Booklet size) paperback with a card stock gloss color cover and Black & White interior. We are at 31-32 pages of content before ads this issue. Expect the contents to be gritty for your Advanced RPG game but the zine to be polished for smooth play. This first introductory issue will be perfect bound and printed on high quality paper with a full color card stock cover. It hardly qualifies as a 'zine, but we want our milestone issues to be special. PDF is 3 bucks. Print is 6 bucks. Print plus PDF is 9 bucks. 4 bucks for shipping in the US.